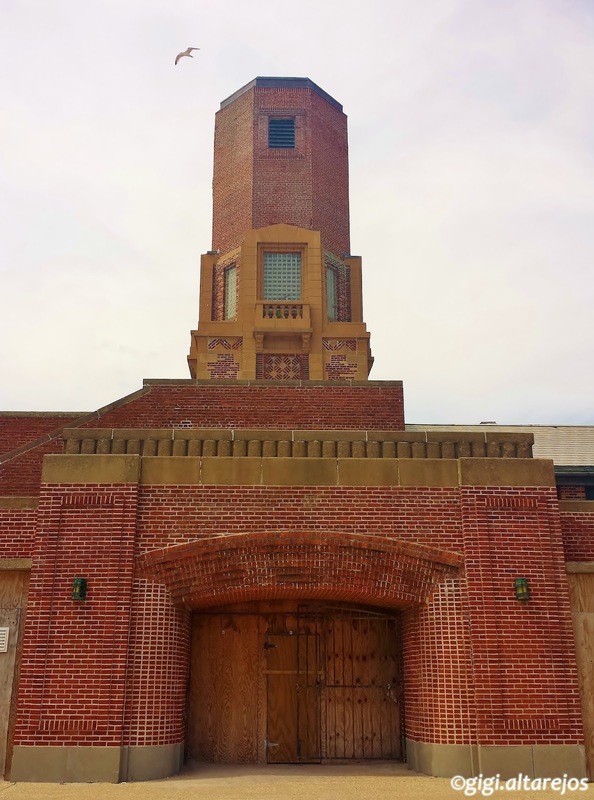 After walking in Dead Horse Bay, Floyd Bennett Field and Fort Tilden, which I wrote about in my previous blogs, our group made our way towards Jacob Riis Park in the Rockaways. From Fort Tilden, we walked along Beach 169th Street to reach the Jacob Riis Park Promenade. The Jacob Riis Park, like Dead Horse Bay and Floyd Bennett Field, is part of the Jamaica Bay Unit of the Gateway National Recreation Area managed by the National Park Service. The park is named in honor of Jacob Riis, the famed New York City journalist and photographer who documented the plight of the poor and working class in the city's tenements. Today, the park's ocean beach and landscaped walkways, boardwalks and courtyards still provide city dwellers, many of them new immigrants, an opportunity to spread out and enjoy the open air. Constructed on the site of one of the first US naval air stations, the park was designed in 1936 by innovative Park Commissioner Robert Moses, who had also created Jones Beach on Long Island in 1929. Moses envisioned Riis Park as a Jones Beach for poor immigrants, a destination accessible by public transportation and closer to the city. Jacob Riis Park was transferred to the control of the National Park Service in 1972. The beach looked beautiful and the water was inviting to see that hot summer day when we walked along the promenade. It was good to see a lot of families enjoying the day. We passed this abandoned shack along the promenade. It seems like a kiosk that used to sell beach items. I think it was damaged during hurricane Sandy and was never repaired. We also passed this food truck doing brisk business in the area. I think there are no permanent structures in the park that caters to selling food stuff, only these food trucks. I was always lagging behind as I was busy taking pictures while we were walking, but it gave me the chance to take a picture of my group mates as they were walking abreast along the promenade. At the east end of the promenade is this beautiful standing clock. The Wise Clock, or sometimes known as the Riis Park Memorial Clock, was installed on the promenade in 1941. Although the exact origin of the clock is unknown, it was probably built in the 1890s as a special-made item by the Wise Jewelry Store in Brooklyn, although some sources claim that the clock was manufactured by the Howard Clock Company of Boston. The clock stood in front of the Wise Jewelry Store at Flatbush Avenue and Nevins Street for approximately years. It was then moved with the firm to a new location at Fulton Street near Hoyt where it remained for nine years. From there it was moved to 288 Livingston for about five years before being removed to the park. The clock was donated to the Department of Parks by William A. Wise and Son in 1941 when the firm went out of business. Here's a closer look of the face of the clock. See those little dragons? The base of the clock was cast iron, and from the pedestal top and above it was wood. The clock itself was twelve feet high in height and the overall height of the standard about 20 feet. There were four faces on the clock, each face being four feet in diameter and each dial 30 inches in diameter. The clock had elaborate detailed scroll work throughout the pedestal. Near the clock is an art deco structure, the park's bathhouse which was built in 1932 and is listed on the National Register of Historic Places. The bathhouse provides a place to get out of the sun and learn about the park's history. But as you can see from the above photo, the entrance is boarded up. Once easily accessible public transportation was established from the city to the shore, the beach was finally crowned with a magnificent Art Deco bath house, which added a level of opulence to the site that many of the local visitors had not experienced. With two octagonal red brick towers and sweeping curved changing rooms more akin in style to Berlin's vanished Templehof airport, it was a lavishly tiled and glittering gift to the city's less well off. But time and neglect soon caught up with the bath house, and in the 1990's ownership was transferred to the federal Gateway National Recreation organization who planned on completely renovating the site. But after $20 million in restoration, funding dried up and the bath house was left abandoned. The windows were boarded up and the bath house started to be covered by sand dunes and weeds. In addition to the ravages of time, Hurricanes Irene and Sandy devastated the area. It's a sad thing to see happen to what was once a beautiful structure. A little further to the bathhouse is another abandoned structure with a smokestack which I learned was the Neponsit Health Center. The closure of the property seems to have its share of controversy. The current sad state of the property can be traced back to September 7th, 1998 when a strong Labor Day storm rolled through Rockaway. The storm, allegedly, caused structural damage to the Neponsit Health Care Center. At the time, Mayor Giuliani’s administration said that the buildings were in “imminent danger of collapse.” Close to three hundred residents were forced to evacuate the buildings a few days later, without being given prior notice. Many of the residents, who had Alzheimer’s and dementia, were bused to other hospital wards and nursing homes across the city in a move that was traumatizing to some. Two residents died while being relocated to acute care facilities and another resident couldn’t be found for several weeks. With the sudden closing, there were rumors that Giuliani wanted to sell the land to a political ally and friend, to turn the facility into an oceanfront hotel. The plan was tripped up because the deed to the land requires it to be used as a health care facility or a park. With the residents removed and the hotel plans thwarted, the City made plans to clear the property and turn it into park land. A Legal Aid attorney, however, got a court-ordered injunction in October 1999 which prevented the city from tearing down the buildings. Where else can you see people sunbathing under the shadow of an abandoned building? I guess, only in Queens. The Neponsit area also has a beachfront. Its residents have been busy preparing for the next superstorm. The area near the houses are now fortified with sand bags. For the residents to get to the beach, there are access areas in a small gap between the fences. I guess the residents have learned to live with it and enjoy each day as it comes. From the Neponsit area, we walked more than 30 blocks to get to the A train shuttle to take us to Broad Channel to our next destination, the Jamaica Bay Wildlife Refuge. The stained glass artwork at the train station depicted beach life, how cool! 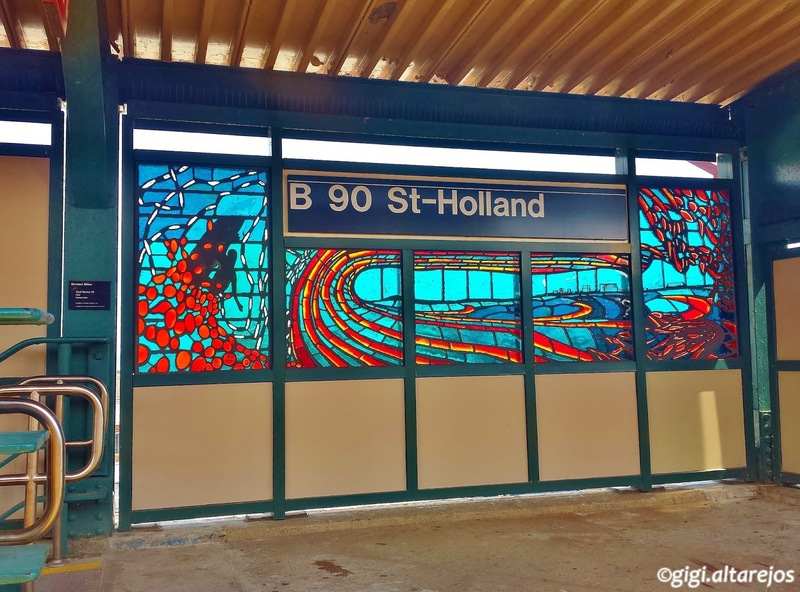 While on the train, I was also able to snap a quick photo of Michael Miller's stained glass work at Beach 90th St- Holland titled Surf Station 90. The S train shuttle took us to Broad Channel, the last part of our walk for the day. This was my first time to visit the Rockaways and I'm glad I was able to. Jacob Riis Park is a beautiful place, I hope the National Park Service will develop the area, restore the bathhouse and provide more amenities. And I hope I can go back in the area again, soon.